On Wednesday, Feb 6, the Club meeting had an attendance of 15, plus a visit from past member Dave Atwood. $7 went to 50/50 and $10 was contributed to 50/50. Andy presided over the meeting in Jay's absence. Where does the time go? January was the longest month of the year! On Wednesday, Jan 30, the Club meeting had an attendance of 16. $9 went to 50/50 and $12 was contributed to 50/50. There was a brief Special Board Meeting to approve the signators for the remaining Club year, as well as for 2019-2020. On Wednesday, Jan 23, the Club meeting had an attendance of 15. $7 went to 50/50 and $18 was contributed to 50/50. There was not a speaker on January 23 due to a late cancellation. However, it did offer opportunity to discuss highlights of the most recent Board Meeting and upcoming actions that will be requested of the Club Members. On Wednesday, the Club meeting was a light again in the attendance with 12. Many regular attending members were traveling. $6 went to 50/50 and $10 was contributed to 50/50. There was not a speaker on January 16. However, January 23 meeting is expected to have a District representative. On Wednesday, the Club meeting was a bit light in the attendance with 10. $6 wen to 50/50 and $6 was contributed to 50/50. The speaker was Dr. Rahul Mehra, PhD on an update to Child Health Education in India project which Pueblo West Rotary aided in the funding of the project a couple years ago. Happy New Year!! I want to apologize for the delay on the first Club Meeting of 2019 briefing. However, Anthony Sandstrom was gracious enough to provide notes on the events of the meeting. The Club meeting was attended by 13 Rotarians. The tallies of the 50/50 and Happy Bucks were not provided at the time, but I'm certain the pot was full of gratitude as always. The year started with getting back to having speakers as much of the later part of 2018 was primarily club business. The first speaker of 2019 was Nina Vetter, Pueblo West District Manager. She attended our meeting even before her first day of work. On Wednesday, the Club meeting was attended by 17 Rotarians for a 68% attendance. Pete was back to winning,but our regular guest, Jaime Burt from 43 took the big pot. Double digit Happy Bucks again at $20. Much of the meeting today was a round of updates from several Board members and committees and general discussion of getting back to speakers on a regular basis starting in 2019. If you have any speaker recommendations, please contact Jay Pechek. In addition, a Speaker Chair will be assigned to program 2019. 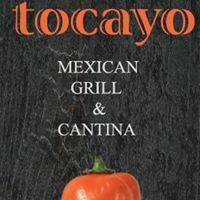 A special thanks to the Tocayo Team on the amazing food and service for the 2019 Xmas Party last Thursday! Thank you Luke Kita for organizing this well attended event of food and friendship!! On Wednesday, the Club meeting was attended by 16 Rotarians for a 67% attendance. Tony Scanlon kept his winning streak alive with more 50/50 winnings,along with Kay Gillen taking the big pot. Double digit Happy Bucks again at $22. Much of the meeting today was a round of updates from several Board members and committees. On Wednesday, the Club meeting was attended by 15 Rotarians and 2 guests. Tony Scanlon was the big winner with $7 from the 50/50 Pot. And double digit Happy Bucks at $15. Fabian Crespin, with Farmers Insurance and a guest of Luke Kita, was welcomed this morning by the group. Josh Stuart, was approved as a new member at the meeting... So technically we started with 15 Rotarians/2 guests, and concluded the meeting with 16 Rotarians/1 Guest. ClubRunner is hopefully being utilized more by members. It has become the primary source of emails, meeting notices, bulletins and events to maintain consistent updates and communication with the Club. Yesterday was standing room only, with 18 Rotarians and 3 visitors...and not just because Tocayo was stacked with dictionaries waiting to be given its Rotary "stamp" and be delivered. Combined, Tony Scanlon and our regular 43 Rotarian, Jaime Burt, collected on the $8 50/50. Excitement continued with an abundance of continued thankfulness following Thanksgiving, with $21 in Happy Bucks. All were excited to see Jay Pechek back at the helm, with Jay sharing his many thanks to all that have provided support. Though the meeting was short, nearly 600 dictionaries were stamped and sleeved by all 21 in attendance to have the books out the door for deliveries by 8am. It was a great time of fellowship while maintaining the assembly lines. Today, the meeting was a little light in attendance, but still a quorum, with 11 Rotarians and 3 visitors. Pete Sutton collected $7 from the 50/50 Pot. Pete has been on a roll this year!! Even with the smaller group, there was plenty of happiness, thanks and blessings spread amongst the group with another $20 in Happy Bucks. Duane Greenfield was successfully moved last Saturday. Many thanks to those who volunteered their Saturday morning to assist our fellow Rotarian. As you may notice, emails are flying about. I want to apologize if you are receiving multiples as I learn my way around ClubRunner. Please note, in addition to receiving emails, many of the bulletins and events can also be viewed using the ClubRunner app on your phones. Speaking of events, brief updates were announced today. Rotarians have so many things to be thankful for. We are especially thankful for our families and many friends. We are also thankful for our military personnel who have served and are serving our country to protect our freedom. We are so thankful that we are so close to eradicating polio. We urge you to continue to "Be a Gift to the World" with your continued support of Rotary. We are very proud to be citizens of our fine communities across Southern Colorado and especially Pueblo West. Hope to see you tomorrow, however, if you can't make it, please be safe in all of your travels during this holiday season. We take this opportunity to wish each and everyone of you, a very "Happy Thanksgiving." It was a full house at the November Board Meeting. 8 Board Members were present, along with 6 other members. The enthusiasm from the morning Club Meeting carried over to the Board Meeting!! Jordan Lussier was voted in as a New member. Jordan gained interest in Rotary after meeting with Pete Sutton at the Oktoberfest. Melanie Phelps was approved for the position of At Large Board for remainder of the 2018-2019 Year. Mark Trevithick is working hard to bring a full financial update in the coming weeks. Chad Heberly, as always, provided a very thorough and detailed investment report to the group. He covered the mixed equity, down bond markets, upward interest rates and its effects on our current partial risk management with a 60/40 high risk range. He also briefed the group as to the history of the fund. Chad provided recommendations for consideration on possible shifts to ultra short bond funds to offer liquidity while maintaining stability and little risk. The entire group was very engaged in the discussions of our investments, scholarship history, and our Club's future sustainability. Further conversations we had by all on the scholarships. Ranging from its original inception, the changes over the years, our current commitments, fund resources. Everyone had valuable input into looking toward the future of scholarships. The Scholarship Committee is being asked to evaluate our current program and evaluate its fiscal stability, both short term and long term. Quick Books is nearing full implementation. This will help with dues collection, accounts receivables, and payments. There are still some hiccups, and in the short term, the old school paper invoices and communication will likely be provided to those with outstanding accounts. Different rumors and conversations have been about regarding Oktoberfest. Short clarification, Oktoberfest will go on, but new members will need to take over the torch. However, Andy and Mitch will still offer guidance as needed. UPDATE: Dictionaries are in!!!! November 21 Club Meeting is expected to be the Sleeve/Insert Party. Make sure you make it. This is a great opportunity to get to know your fellow Rotarians. The distribution date is still to be determined. Also, with current increase in costs, other options are being pursued to make sure this program continues. Today, the meeting was near capacity with 18 Rotarians and 3 visitors. The ever popular 50/50 was dominated by Luke Kita for the $1 and split of the $12 pot. At the same time, there was plenty of happiness throughout the room with nearly $20 in Happy Bucks. The happiness ranged from visits with grandchildren to calls between Rotarians. 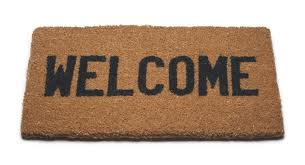 Duane Greenfield will be moving rooms at Brookdale this Saturday at 8am. Chad Heberly has asked for volunteers to assist. We have a couple volunteers, but need a couple more. Please contact him directly if you can help. Luke Kita was on a roll today and announced he is heading up the Holiday Party!! The Holiday Party will start at 5:30 on Thursday,December 13th at Tocayo. A signup sheet was passed around, including gift exchange information. Please reachout to Luke if you are planning on attending. A separate email is expected in the future. Melanie Phelps provided the status of the proposed new sustainable well in Nicaragua. The 2019 Calendar sales have generated over $1600 in profit thanks to all the sponsors of the calendar. In addition, Palmer High School has raised nearly $4600. There are still 2019 calendars available. Please help in selling the remaining 250 in inventory. Even selling at $10 each can help tremendously. Perfect for stocking stuffers. Though there is not a set date for the construction of the well, it is anticipated the same contractor will be available, and has assisted other Rotary clubs on similar projects. Ultimately ,the cost for the well will be nearly $60,000. $20,000 is needed, even by cooperating with other Clubs, in order to get matching grants for the remaining $40,000. Melanie Phelps added to the good news that she will be a Treasurer in Training with Mark Trevithick, our current, tireless Treasurer. Melanie anticipates this training will get her the nod for Treasurer during the 2019-2020 elections. I was voted to fill the current Secretary vacancy through its 2018-2019 term. The 2019-2020 elections may require a new vote to extend another year. There may still be a few small sized Rotary polo shirts from earlier this year. Inventory and outstanding orders will be reviewed and if any are still left we will announce. Otherwise, a new order will take place in the new year. Gordon MacAlister lead the 4-Way Test at the end of the meeting. Rotaract is hosting their Santa Run on December 9th at Mineral Palace Park. This event has something for everyone. 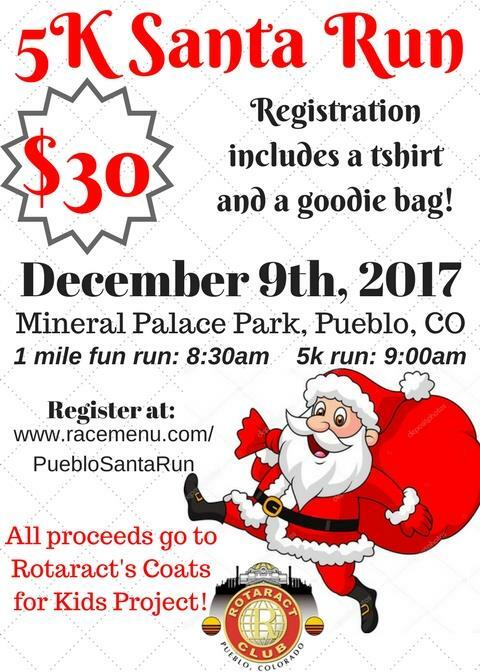 There will be a 1mile fun-run for those who prefer to support the event but aren't big on running, and a timed 5K for those looking to go a little farther, or a little faster! Most importantly, the proceeds from this event support the groups coats for kids project. Over 800 children in our community have been identified as needing a warm coat. Some of these kids are homeless, couch-surfing or living with friends. Some of these kids just need someone to care. Register today to support these amazing young leaders and a most worthwhile cause to keep local kids in need warm this winter! The Rotary Club of Pueblo West has developed "The Flag Project" as a means to promote local patriotism and to help other not for profit community groups to raise funds. When a resident of Pueblo West subscribes to this program, an American Flag is placed in front of their residence on the street for each major holiday during the spring, summer, and fall. This includes Memorial Day, Fourth of July, Labor Day, and Veterans Day. Organizations that meet the Pueblo West Rotary Club's criteria can sell subscriptions and then keep a portion of each subscription payment. Please select the link below and you will be directed to a website where you can subscribe to having a flag displayed at your residence. The Golf Tournament looms large. Many hands make short work of a big Task. Please get involved and help out if you can. As has been often repeated, this is one of our 3 crown jewels of fundraising. Congratulations to the Scholarship Committee! Our two new 2015 recipients will be introduced at the June 3rd Meeting. After a little anxiety, hard work and dedication paid off. 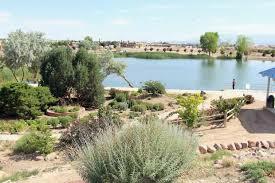 The Pueblo West Rotary Club Recognition and Kick Off Picnic will be held at Lovell Park the evening of June 25th. Save the date. It will be a good time and allow an important “Thank You” to our past and future officers. In addition, an ongoing discussion continues concerning a Club tour of SDS with Walker Ranches and the creek control works near I-25 exit 123 being the focus. A final note, it was announced at our May 13th meeting that our attendance is up to 80%. This is a great achievement. Your humble editor attributes this to your dedication and to our President’s steady parade of interesting and relevant speakers. 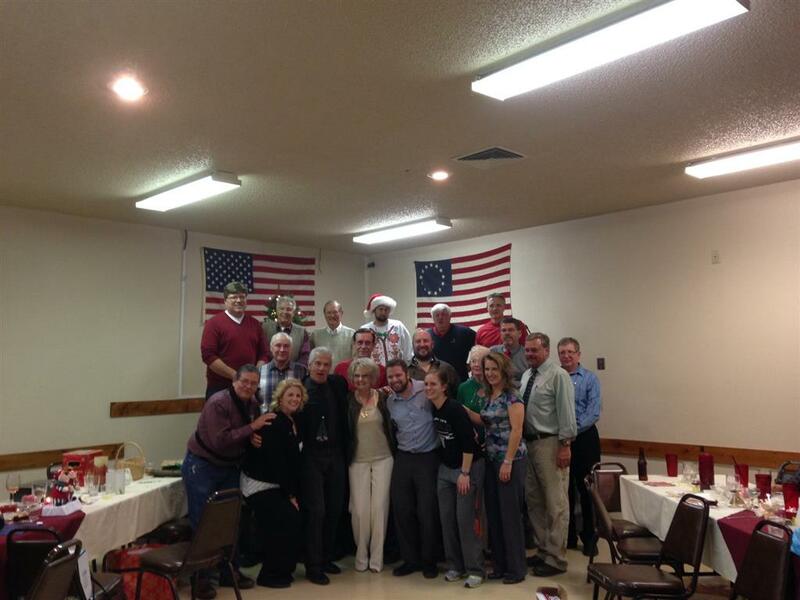 A great time was had by all at the Pueblo West VFW on December th. The food was fantastic and the “White Elephant” gift exchange was awesome. 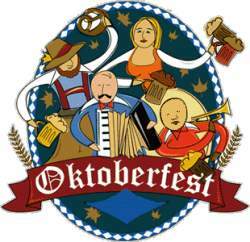 The PW Rotary Oktoberfest was a huge success on October 3rd and 4rth. It was coincident with the District Convention in Pueblo and really showed the impact that our club has on the community. Over 2,000 residents and visitors participated in the event. The Martini Shot headlined Friday night and Dr. Fine headlined on Saturday. 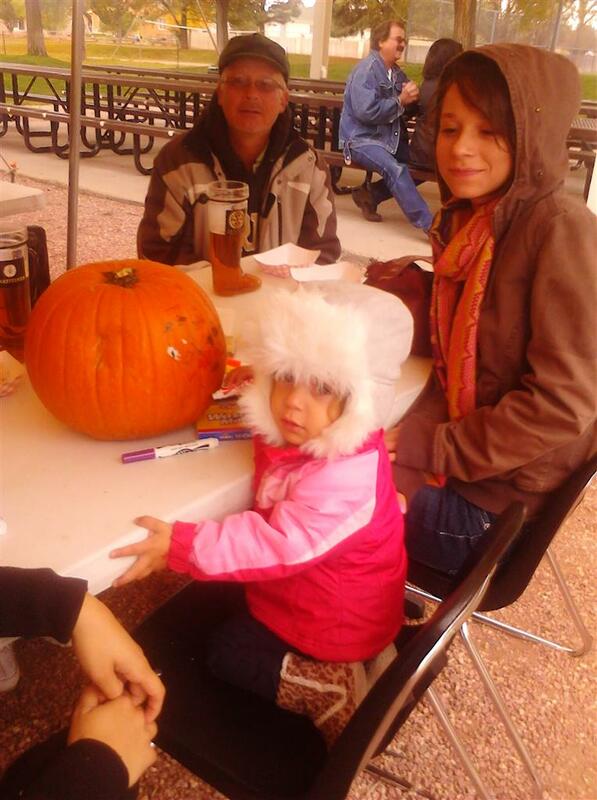 Kids activities included pumpkin painting and bounce houses. Face painters and balloon artists were on hand. Our local Cultura Restaurant provided excellent Oktoberfest style food. The Brews Brothers kept the suds going. Many Rotarians pitched in to work this event. A great time was had by all. Pueblo West Rotarians Diana, Bruce, Dean, and Dave worked at the Pueblo Community Soup Kitchen on 7th Street Saturday morning of August 23rd. Over 110 meals were served. Dave & Dean are shown below. District Governor Wally Miller will visit the Rotary Club of Pueblo West this Wednesday, April 16th. District Governor Miller is a retired Air Force Colonel and Air Force Academy instructor. DG Miller owns an aviation and communications firm. He has continued his distinguished service record with rotary, receiving a Rotary International Extension Award for his instrumental role in sponsoring and starting a Rotary Club in Ramallah Palestine. DG Miller is an inspirational speaker whose passion for Rotary and service above self can be seen on his face and heard in his words. Don't miss this weeks meeting! Club members will begin the day with a general cleanup of the area and planting trees and other plants to replace those that have been lost since the project was initially completed. If you were involved in this project, this is a great opportunity to revisit a cornerstone project for our club. If you joined after the completion of cattail crossing, this is a chance to put your own stamp on the park! After the work is done, the club, and family will come together to celebrate 25 years of people in our community coming together to enjoy the company of fellow Rotarians while working toward the betterment of our local and international communities. 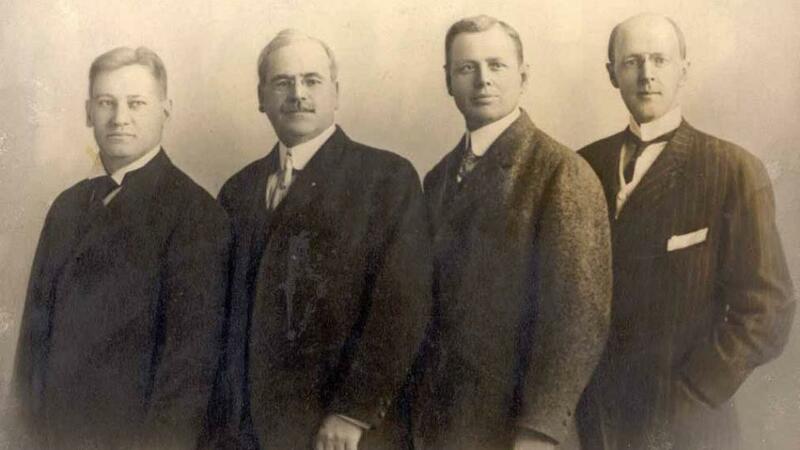 Pictured Above:The first four Rotarians. From left: Gustavus Loehr, Silvester Schiele, Hiram E. Shorey, Paul P. Harris. Between 1905 and 1912. Courtesy of Rotary International. With the closing of La Renaissance Rotary 43 will now be meeting at the Pueblo Convention Center, located at 320 Central Main St., in the Bernstein Room. The meetings will remain at 12 PM each Monday. 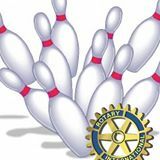 Marty Wilcoxson of the Minnequa Rotary Club has extended an invitation to a joint member social outing at the bowling alley. This is a great opportunity for our club to get out and have some fun with one another and other Rotarians within our community. We hope to see you there. Look for an invitation to this event via clubrunner in your email soon! This is a proposed event that will be discussed and voted on at our weekly meeting on 7/10/13. The Fishing Derby was a great success thanks to everyone that helped. Here ia a picture from last years. 2014-2015 District Governor Clyde Church. on June 21, 2014 from 1:00 - 3:00 p.m.
Rotarians will come together this Saturday, beginning at 9:00am to spruce up Cattail Crossing. The day's projects will include weeding, replanting where plants have been lost and creating wells around trees for water retention. Get your shovels, rakes and gloves as we do the work of Rotary. 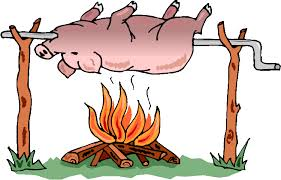 After the work is done, the party will move to Civic Center Park for a pig roast and potluck to celebrate 25 years of Rotary in Pueblo West. A Sign-up sheet for side-dishes/desert/supplies will be passed around at Wednesday's meeting. Simply enter new members into your club's records and identify the sponsor. Each week, Rotary will send clubs a packet containing the names of newly identified sponsors along with Rotary pins and as many as four different-colored pin backers. The color of the backer depends on the number of new members sponsored, ranging from blue for one member to gold for six or more. Keep track of the number of members you've sponsored by checking your My Rotary profile page. Gold-level sponsors will also be listed in the Membership Recognition Gallery, and if they attend the convention, invited to join the RI president for a special recognition event. All new members and their sponsors must be designated in club records in My Rotary to participate in the program. Sponsors of members who joined Rotary on or after 1 July 2013 are eligible. Ready to learn more about Rotary? Your opportunity is coming to Pueblo April 12. The District 5470 Leadership Assembly will be held at the Pueblo Convention Center on April 12 from 8:00am - 3:45pm. First-time attendees will be sponsored by the club. This is for all Rotarians. The day has multiple breakout sessions covering a number of Rotary topics ranging from The Rotary Foundation to membership to marketing your club. Over 100 golfers came out to enjoy a cool Pueblo West day at Desert Hawk Golf Course and to support the Annual Rotary Club of Pueblo West Golf Tournament presented by Sonic and Coca-Cola. 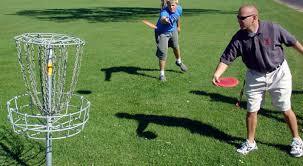 This year's tournament winners were 'Great Balls of Fire' with Kwik Stop and Tumbleweed Tavern rounding out the mens top three. The Ladies Jubic captured the top spot in the ladies divisio while Janean Jubic took home the Ladies Longest Drive and Closest to the Pin awards. Terry Hart won the ball drop with ball/ticket number 399. We could not have a great tournament without our sponsors. 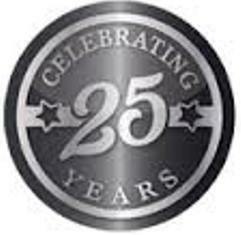 Thank you all for your support of this, and all our other projects over our 25 year history. Thank you to the volunteers who came out to work to help make the event successful! The Rotary Club of Pueblo West was recognized for the Rotary Flags float. The float was put together by Rotarians Frank Nash and Rich Selle along with their families. Rich Selle provided his classic John Deere tractor to pull the float through the dry section of the parade. Great tournament last Saturday. Thank you to everyone who helped out & participated. Great event, the weather soured it some but not to this FUTURE ROTARIAN. 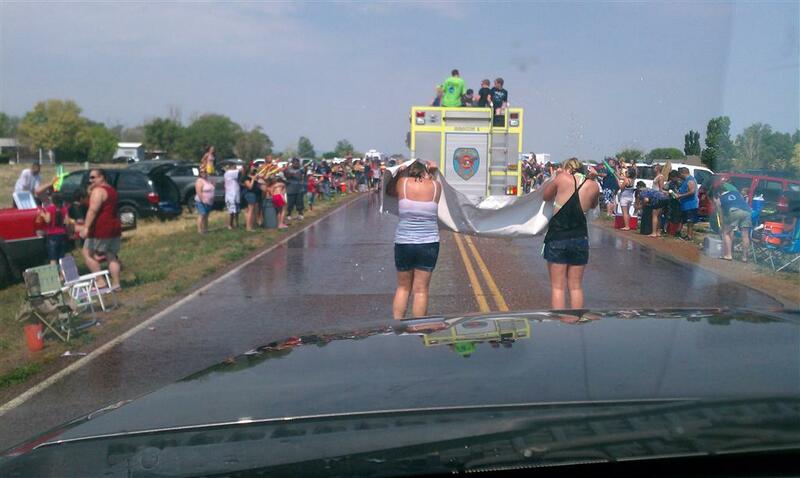 Thanks to all who participated in the WET Parade. THIS IS WHAT THE ROTARY BANNER WAS USED FOR THAT DAY. Rotary meetings include a speaker series to help bring information and entertainment to our membership. The link below will allow you to watch our most recent guest speakers. Is this video all black? Click here to view in your browser.